Non-Silicone #33 works for rubber moulds, moulded rubber and releases almost everything from anything. It also contains an FDA regulated active, for use with food and medical applications. PETROLEASE has extensive applications for prototyping and pattern work. 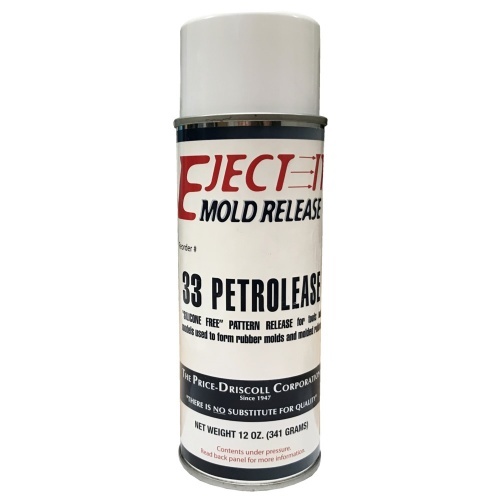 #33 also works well for RTV and tin or platinum curing elastomers. Shake well both before and during use. Hold can 8" to 12" from the surface being treated and fan a uniform mist onto the project. Apply thin films and allow to dry. Repeat if necessary. Thick films are not recommended as they take a long time to dry. This product is flammable. Store in a cool dry environment at room temperature. Handle with care and use suitable gloves to prevent, particularly, long-term skin contact. Refer to the MSDS before use and make certain that the operation is carried out in accordance with the requirements of the document.